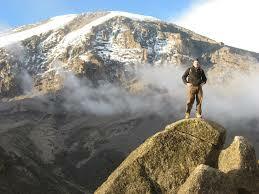 6Day Umbwe route Mount Kilimanjaro climb. The Umbwe route has a well-deserved reputation of being the most challenging route on Mount Kilimanjaro. The Umbwe Route is the hardest you can choose if you wish to climb Mount Kilimanjaro. The first 2 days are very steep, so steep that in places you use tree roots to haul yourself from one ledge on the forest trail to the next. Those adventurous climbers that climb the Umbwe Route reach the Barranco Camp in 2 days, something that takes 3 days on the Machame Route and 4 days on the Lemosho Route. For those that are seeking the ultimate climb of Mount Kilimanjaro, summiting via the Western Breach is for you. Umbwe is considered to be a very difficult and taxing route, one that should only be attempted by strong hikers who are also confident of their ability to acclimatize to the high altitude of Mount Kilimanjaro. This is still not technical but is very tough. For those that dream of pushing on beyond what they thought imaginable and completing a truly amazing physical feat, this is the climb for you. Trek type: Small- Medium group size, Youth and Family, High altitudes. Summit success rates: Stella Point (88%). Uhuru Peak (85%). Sure, Book today. Upon arrival at the Kilimanjaro International Airport code: JRO you will welcomed by ANAPA representative who will usher you into a waiting vehicle and transfer you to the Hotel in Arusha. The rest of the day will be yours to do as you please; you may choose to relax at the hotel or explore the small town of Arusha (Arusha City excurtion). You will have a preliminary talk in preparation for your trek the following days. Dinner& Overnight at Outpost Lodge Arusha. Leave hotel at morning and drive to Mount Kilimanjaro, The climb starts from Umbwe Gate (1,800 m.) The path follows a ridge between two deep valleys up through the dense montane forest. The camp is perched between huge trees and thick undergrowth. There is no water available at this campsite, so we must carry from the gate all the water needed for drinking, food preparation and cleaning. All meals and overnight stay will be served at Umbwe cave campsite. The path gets steeper on this section, as you get out of the forest along the Umbwe ridge the route descends slightly to the Barranco camp situated in the valley. You will enjoy and relax your whole night here at Barranco campsite. A gentle walk takes us down through the rainforest to Mweka gate successful climbers will receive their summit certificates. After lunch we drive back to Arusha hotel. Arusha to Kilimanjaro International Airport (JRO) Private departure transfer is included. v 2 nights’ hotel accommodation bed & breakfast in Arusha before and after the climb. v 2 transfers from Arusha to Kilimanjaro Marangu gate – return. v 3 meals per day while trekking: Vegetarian/non-vegetarian. v 7 days Kilimanjaro trek – Rongai route. v 6 nights’ accommodation in tents while trekking. v All park entrance fees, and government levies. v English speaking mountain guide and assistant. v Porters – minimum of 3 per client. v First Aid Kit including Oxygen Kit. v Camping Equipment’s including sleeping tents, sleeping mats, dining tent, chairs and table. o Iterms of personal nature.